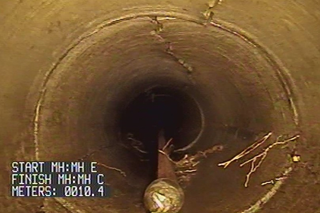 Cure-In-Place (CIP) Main Lining can be used on both sewer and storm mains to permanently eliminate recurring problems such as roots or infiltration and also structural problems like cracks. A resin saturated tube is “blown” into the existing main and steam cooked, leaving behind a single, jointless, smooth pipe that has a tensile strength greater than concrete. 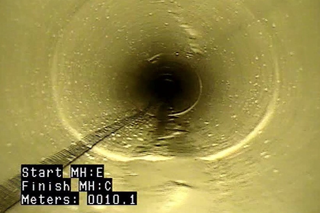 Pipe lining is incredibly effective and remains one of the lowest cost and lowest impact permanent solutions for solving sewer and storm maintenance issues available today. Similar to Thuro’s other trenchless technologies, main lining can repair and restore aging mains all without knocking down fences and landscaping or tearing up parking lots. Tired of constantly spending the budget on maintenance and minor repair fixes to aging mains? Call today and book a commercial assessment of your utility lines. Installing a main liner can add 50 or more years of life to an existing main by reinforcing the existing structure and restoring missing and damaged sections. This liner will not rust, corrode, and is chemically resistant. Rest assured that you will receive tremendous, lasting benefits for an investment in a main liner with significantly lower maintenance and repair costs for decades to come. CIP main liners are blown in as a single, jointless section that will completely eliminate recurring blockages, roots, and all minor structural damages. Call today to discuss how you can share in some of the industry’s best technology.